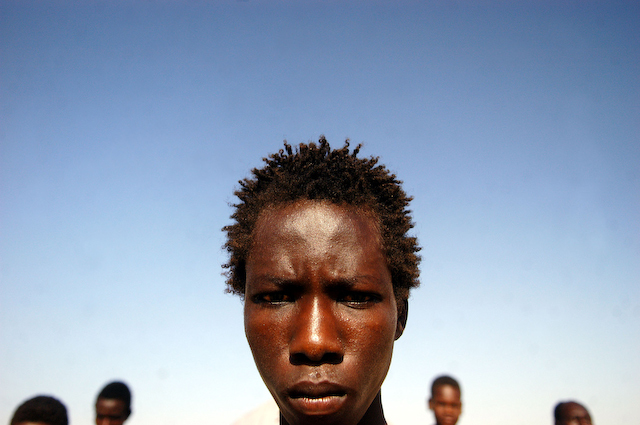 Abdul Hussein Majid Quing, 16, stands at attention while being trained along with other new recruits for the Sudanese Liberation Army in Bahai, Sudan, August 25, 2004. The SlA is one of the Sudanese rebel groups controlling parts of Darfur.Rebels, and are currently staging a 24-hour boycott of the Nigerian peace talks for Sudan in protest of recent new attacks against civilians in Darfur, which they say killed 75 civilians in six villages. Up to 50,000 people have died since the conflict began in February 2003 and more than a million have fled their homes for fear of attack by the Janjaweed.